There was a rumble in the air today, and we knew that the harvest beyond our tree line had begun. During these last golden days of low sun and leaf smoke, while we have made hurried efforts to take care of the final outdoor chores, the unharvested corn in Herb's field has seemed indifferent to the end of the season. We even wondered if he meant to leave these spindly, sere stalks standing through the winter -- in some obscure crop rotation scheme we did not know about. 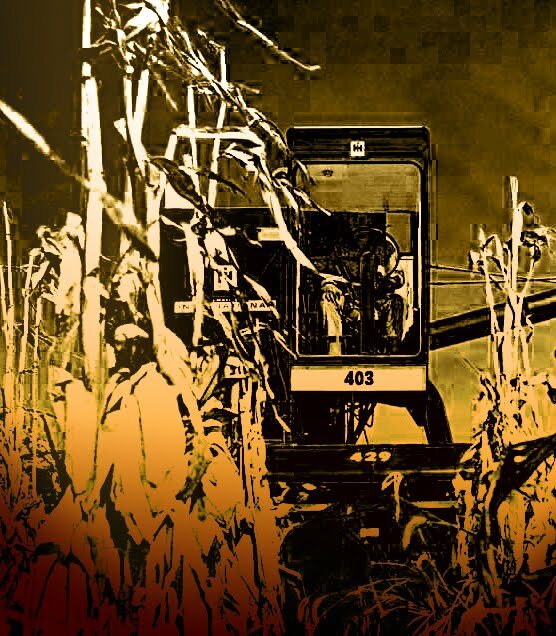 The harvester arrived, however, and the take-down began, filling the air with corn dust. 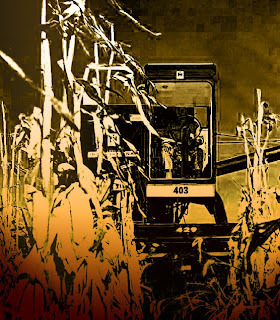 As night fell, the combine lights came on, and the work continued as, in one powerful motion, the corn was cut down, shucked, and spit into the trucks that waited at the fields' perimeters. How odd to look out our windows and see rows of lights, like landing signals, where -- for every other day of the year --- there is darkness. By tomorrow morning, we will be surrounded by low stubble, and the corn will be on the road to its end as chicken feed and ethanol. The air will be quiet again, and we will see a little farther. I love the feel of commotion and lights in the dark then quiet and a view. You are able to paint a view with words so well.